Knowledge of both vegetation distribution pattern and phenology changes is very important. Their complicated relationship with elevation and accessibility were explored through a geographically weighted regression (GWR) framework in Fujian province, China. The 16-day time series of 250 m Moderate Resolution Imaging Spectroradiometer (MODIS) Enhanced Vegetation Index (EVI) dataset from 2000 to 2010 was applied. Wavelet transform method was adopted to decompose the original time series and construct the annual maximum EVI and amplitude of the annual phenological cycle (ΔEVI). Candidate explaining factors included topographic conditions, accessibility variables and proportions of primary vegetation types. Results revealed very strong positive influence from parameters of elevation and accessibility to big rivers and negative effect from accessibility to resident on both maximum EVI and phenological magnitude through ordinary linear least square (OLS) regression analysis. GWR analysis revealed that spatially, the parameters of topography and accessibility had a very complex relationship with both maximum EVI and phenology magnitude, as a result of the various combinations of environmental factors, vegetation composition and also intensive anthropogenic impact. Apart from the continuously increasing trend of phenology magnitude with increasing altitude, the influence of topography and accessibility on maximum EVI and phenological magnitude generally decreased, even from strongly positive to negative, with increasing altitude or distance. Specially, the most rapid change of correlation coefficient between them was observed within a low elevation or close distance; less variation was discovered within a certain range of medium altitude or distance and their relationship might change above this range. 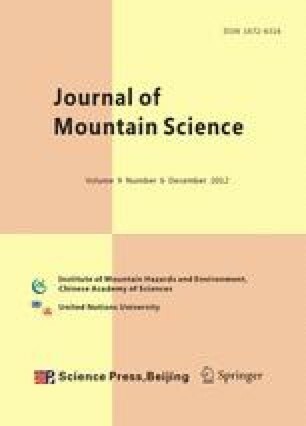 Non-stationary approaches are needed to better characterize the complex vegetation dynamic pattern in Mountain-hill Region.